Charlie “Doc” Shyab receives The Bronze Star Medal with “V” device. 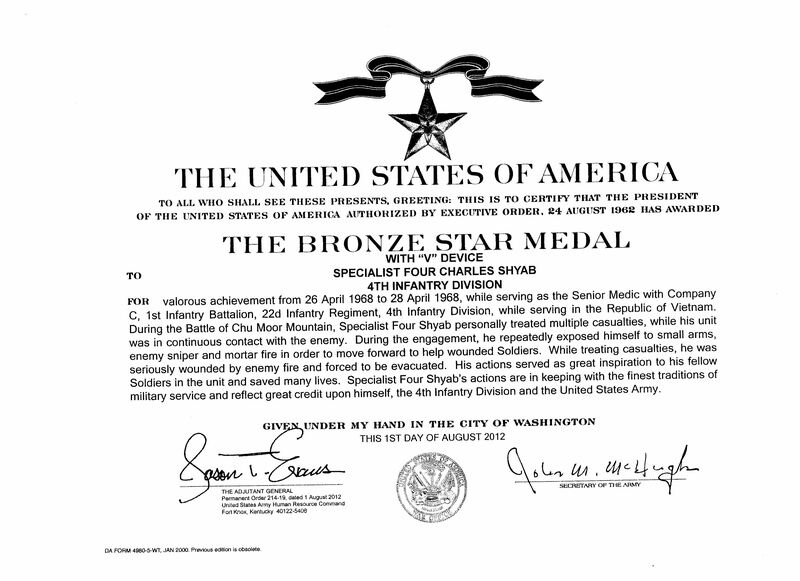 Charlie’s Bronze Star with “V” device was official August 1, 2012. Valorous achievement from 26 April 1968 to 28 April 1968, while serving as the Senior Medic with Company C, 1st Infantry Battalion, 22d infantry Regiment, 4th Infantry Division, while serving in the Republic of Vietnam. During the Battle of Chu Moor Mountain, Specialist Four Shyab personally treated multiple casualties, while his unit was in continuous contact with the enemy. During the engagement, he repeatedly exposed himself to small arms, enemy sniper and mortar fire in order to move forward to help wounded Soldiers. While treating casualties, he was seriously wounded by enemy fire and forced to be evacuated. His actions served as great inspiration to his fellow Soldiers in the unit and saved many lives. FORT MEADE, Md., Nov. 9, 2012 – As the nation approaches Veterans Day, observed Nov. 11, two former service members — one from World War II, the other from the Vietnam War — were awarded their long-awaited Bronze Star medals in a ceremony at the Defense Information School here today. Keynote speaker U.S. Sen. Barbara A. Mikulski of Maryland had worked to ensure that former Army doctor Capt. Charles E. Rath Jr. and former Army medic Spc. 4 Charles Shyab received their medals. Mikulski presented the awards to the veterans, along with flags that had flown over the U.S. Capitol, at the ceremony. Misplaced paperwork was the cause of Rath waiting 67 years and Shyab 44 years for their medals. Shyab’s Bronze Star for valor was authorized in 1968 after he saved many American soldiers’ lives and was wounded on Chu Moor Mountain in Vietnam near Ho Chi Minh Trail. “We were in [the enemy’s] backyard,” he said of the fight that April day in 1968. “Once they found out we were there, they started mortaring us and when our place went over to drop a 500-pounder, they used that noise to mortar us and that’s when I got wounded.” Shyab said the soldier who got him safely to a helicopter for evacuation never made it back to his foxhole. Thirty men were killed in action during that firefight, Shyab said, another 70 were wounded and 15 were evacuated off the mountain. Shyab said he doesn’t recall how many lives he saved that day. “The men we lost will always be remembered,” he said during the ceremony. Defense Information School Commandant Army Col. Jeremy Martin, left, looks on after Army veteran and former Spc. 4 Charles Shyab was presented the Bronze Star medal for valor by U.S. Sen. Barbara A. Mikulski during a formal ceremony at DINFOS, Nov. 9, 2012. The ceremony was attended by roughly 250 family members, community leaders, DINFOS staff and students. U.S. Army photo by Spc. Joseph Joynt. Congrats Mr. Charlie I am so honored to know you. It was so nice to see you again this weekend in Columbus. Ga.
Wishing you guys a happy Veterans Day! It was nice to have met you all while we were all in Columbus back in September. By the way, I had the baby two days ago! Thank you Anya. Congratulations on the baby and no sleep for you. Hooah.